Multi-Sensor Inspection (MSI) data including 3D LIDAR data to help engineers design and plan rehabilitation projects. 3D Engineering Reports take Multi-Sensor Inspection (MSI) data, especially 3D LIDAR data, and help engineers design and plan rehabilitation projects in a way never before possible. In planning rehab projects, engineers must select the type of rehab to use, the geometry of liner to use (diamater, shape, and section length), locations to place access pits, and must consider conditions like bends, size/shape changes, and special features in the pipe during the design. 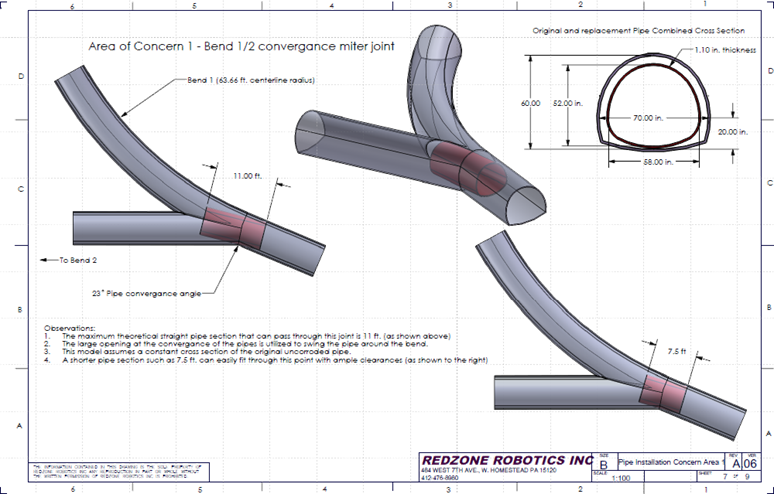 Bend Radius Reports: Detailing the position and geometry of all bends in a pipe’s alignment. Alignment Reports: Detailing where a pipeline meanders underground in X, Y, and Z. Virtual Mandrel Reports: Checking a proposed geometry and length of slip-lining pieces for locations in the pipe where bends or protrusions may interfere with installation. To start the process of creating a 3D Engineering Report, all MSI data is combined into a comprehensive 3D model of the pipe and related infrastructure (junction chambers, manholes, other structures). Not only does this model include measurements of the pipe’s cross-section size and shape at every point, but the model also includes bends in the horizontal and vertical planes. Once the 3D Model is assembled, CAD and other specialized tools can be used to help answer questions and perform what-if analyses regarding potential rehabilitation techniques. An alignment map can be created plotting the pipe’s meander underground. Bends in the line can be identified and measured so that they can be taken into consideration. 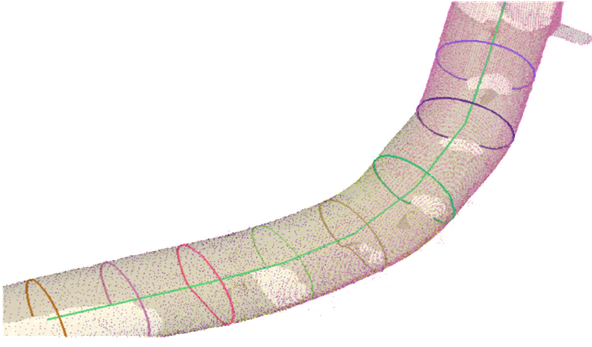 A ‘virtual mandrel’ analysis can be performed where a slipliner of a given size and shape is virtually slipped through the 3D model to determine areas where interference may occur.